Surprise! I’m back again today friends and I hope you are having a glorious summer! 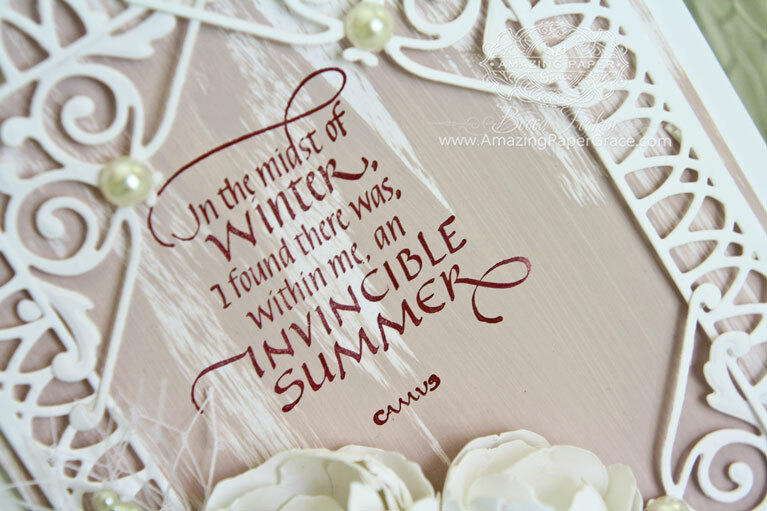 Speaking of summer (although figuratively) today I’m using a new quote stamp from QQuietfire Design that I haven’t used before – In the Midst of Winter. It was my mission today, not to use gold, lol. As a shopper, I’m perpetually on the hunt for the “right shade of pink” and last week in the craft store I randomly bought a bottle of chalk paint because it was precisely “the right shade of pink”. At the time I knew that I’d be painting it onto paper; I swoon over the texture of chalk. So there you have it, that was the inspiration for today’s card – an ode to pink. The base of the card is 5-1/2″ x 7-1/2″ on white Neenah cardstock. I used the same white paper cut to 5″ x 7″ and painted chalk paint down the front with a foam brush that I had blotted most of the paint off of. It dried in less than 5 minutes. (By the way, I used the Hinged technique to make the large card base). I used Spellbinders Labels 52 Decorative Accents along with corner elements from Spellbinders Imperial Square. The lines on the die are fairly narrow so the best way to adhere the frame to the base was by using thin slivers of double stacked foam tape. Both the painted layer and frame are elevated this way. I reached out for easy Spoon Flowers using Spellbinders (Contour Die) Layered Blooms. Using just the two smallest petals I created two spoon flowers using three medium petal sets and two small petal sets. Then I created a smaller bud using three small petal sets. They were glued onto a Seam Binding bow and embellished with net and a corsage pin. I finished up with four large pearls in each corner – 1 is hidden. Every Friday it’s my pleasure to give away a card. The card goes to a randomly picked reader (worldwide) who leaves a comment in our conversation. Want to know more about Day of Giving, here’s a link to my FAQ’s just check out #11. For your comment today: What’s your favorite color and why? 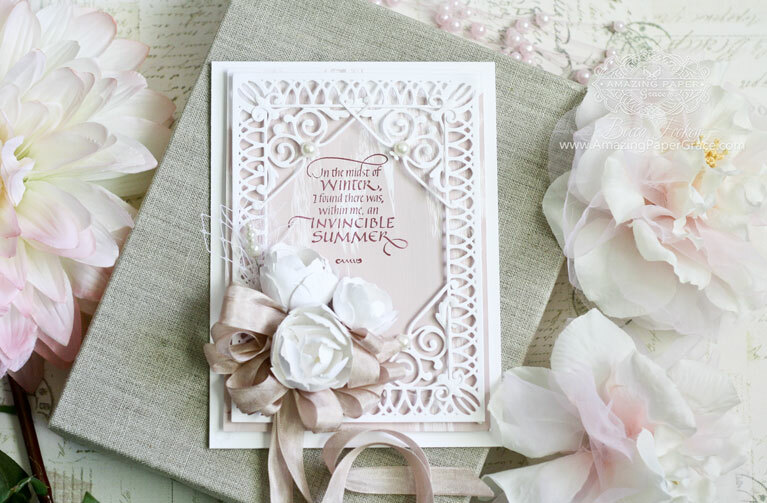 Accessories: Spellbinders Labels 52 Decorative Accents, Spellbinders Imperial Square, Spellbinders (Contour Die) – Layered Blooms, Hug Snug Seam Binding – Rose Beige, Recollections Pearls, Corsage Pin Just a note to say don’t worry if you don’t do Instagram :-) It’s all good! I have several new friends over there and I love it that I never miss a comment over there – I get alerts and it alerts folks that I’ve responded back. That said, I encourage you to live fully within your comfort zone with no apologies. Have a great weekend friends – you’ll likely see another card from me because I’ve cleared up my desk to create!! My favorite color…pink! Just love it! So shabby chic and pretty. As always…your work always impresses me. Hope all is well with you and your family. Oh, Melissa, so sorry for your troubles earlier this year. I do hope those bad times are behind you now and you will have much joy in the days ahead. Another stunning and fabulous card here Becca. I just LOVE your white cards with just a tiny splash on color to them, and as always the sentiment is sooo awesome too. My favorit color or colors are all blue/green shades, and don´t ask me why cause I simply don´t know, I just know, that I´ve always loved these shades and seems to use them a lot in everything I do, except from, when I think about it and by purpose choose something else he he he. Hi Becca, beautiful card, I don’t know why but I love the blues. Enjoy the Summer and take care. Cleared your desk? Egads, I need to do that too. And then I need to separate my big scraps and recycle the smaller scraps. One of my favorite sayings…I created a counted cross stitch of this a few decades ago, and just love it. Favorite color – depends on the day and mood, but I tend to move towards greens and blues…purple. Lately I’ve been loving working brights on black…yellow. Fun fun fun. Love this card, and thanks for challenging yourself to work outside your gold comfort zone. I know how easy it is got get caught in a cycle sometimes! Can’t wait to see what you’ve cleared your desk off to create! A very beautiful card , loving the design and the verse. Hopefully Summer will be better for My Son and all our family , we have had a terrible 3 months of Hospital and tests , my lovely son was diagnosed with cancer and after major surgery and 3 weeks in intensive care was allowed home on Monday ,however he has to get his strength back and has such a long way to go ,we can only pray that all will be well after the intensive treatment. My favorite color is coffee with cream , i think it has class and works so well together. Thank you for your kind words Becca, Andrew was admitted to Hospital again last night ,he has some sort of infection ,we hope it gets sorted soon. Thank you so much Chelsea , sadly Andrew was admitted to Hospital last night , he now has an infection, hopefully it will be soon be sorted out , then we can concentrate on getting him stronger . Thank you Vickie it means a lot . Elaine so sorry to hear of your sons struggles will be praying for him hope everything turns out positive of you all. Anything Ido with GOLD or PINK is always good for. My really fav is soft pastel yellow – just so soothing. Yellow reminds me of the sun and that makes me happy! Have a great weekend my friend. Oh Becca – I just love the subtlety of the white with the pale pink chalk paint. The card is a picture of elegance. This is a beautiful shade of pink; it has a feel of sophistication to it. I think pink is kind of an elusive color. I have to look at it closely when it’s part of my card palette to see what undertones it has. Last Christmas, I was trying to match what I thought was an off-white/ivory background and realized later it was the palest hue of pink. Being a card maker has definitely helped me to be attentive to the subtleties of color. My favorite color is red – it delights my senses! I’ve discovered a little can go a long way, however. Happy creating, ye with a clean desk! Creativity is such a messy business, isn’t it? I’ve know of people who can be productive in chaos but not me…order lets me clear my mind and free my spirit. Looking forward to the fruits of your labor! Beautiful pink and white card!!! 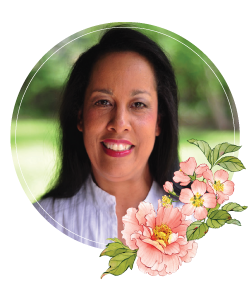 I’d love to see you use more silver and some purples and lilacs, or some turquoise–just because I know you can make anything you create beautiful, these plus a lime/grass green are favorite colors and I’d love to see what you do with them too. I am a purple girl, so more about silver but I enjoy the warm colors of autumn leaves too. You always inspire me, and I’m so grateful, Becca. green is my favourite I call it Gods colour ! It goes with anything just look at the landscape around us and the flowers. Love this card!!! What a clever idea to use the chalk paint for your background. You astonish me, Becca. You have created a wonderful look with this card. What a beautiful card and just a touch of pink, never would have thought of painting the paper.All lavender and purple shades, I just like them, I do use other colors. What a beautiful card! I never, ever would’ve thought to use chalk paint on a card in any way! You are always so inspiring!!! Another beautiful card, Becca! Absolutely love the brilliant simplicity of the chalk paint background.. It really contributes great texture and flow to your card. Good morning Becca, what a treat, another post oodalally!!! My favourite colour is green!!! I just love it. I put it down to my star sign!!! Beautiful card Becca!!! My favorite color changes almost everyday…depending on what I am creating. Today it is green – LOL! Hi Becca, this is a gorgeous card love the dry painting and love Pink also but like you has to be the right Pink I also like the Blues and Greens. My favorite color is turquoise. I guess it is my favorite because it brinsg out my blue eyes and I also look good in that color. Hi Becca, This card is so pretty, I love the texture of the pink paint onto the white card, it looks slightly ‘icicle’ like, and these beautiful flowers, I have just bought this die, so I will be trying these flowers you have described, and the background is beautiful, to complete this card is the wonderful sentiment and bow etc. Stunning !! My favourite colour is purple/lilac or gradations thereof, I simply love these colours and when combined with gradations of green I’m in my element hahaha. Your creations are so inspiring – not just to see but to read. I also love to share words that encourage, inspire and tickle the spirit of the reader – I do it with fabric, paint, paper flowers, quotes, puns, tags, etc. I market them locally at craft fairs, festivals, holiday shows, and an art and frame shop close by. I truly believe others see the love in what we do and that’s what inspires. Best wishes in all your endeavors. When I need a moment of inspiration I click on your bookmark asking to be taken to Amazing Paper Grace. It’s hard to choose just one – it would be easier to tell you the color I am not fond of – gray! Since I was a little girl, contrasting colors always appealed to me – probably a reflection of my personality. If I had to choose one it would probably be in the pink family because pink makes me think of babies, soft things and cuddly things-innocence and purity. Thank you for asking Becca. Teal has always been my favorite color since I discovered it many years ago. Another gorgeous card with the beautiful “spoon” flowers. Thank you. My favourite colour is green, because it reminds me of my mother but for card making it has to be blue or teal. This all white card is just beautiful. One of these day I need to try an all white card. but my favorite color in stamping is pink. This card is gorgeous. You are always thinking outside of the box! I am not sure if I have a favourite colour. I do like whites, pinks & creams, but I love all different colours as well. 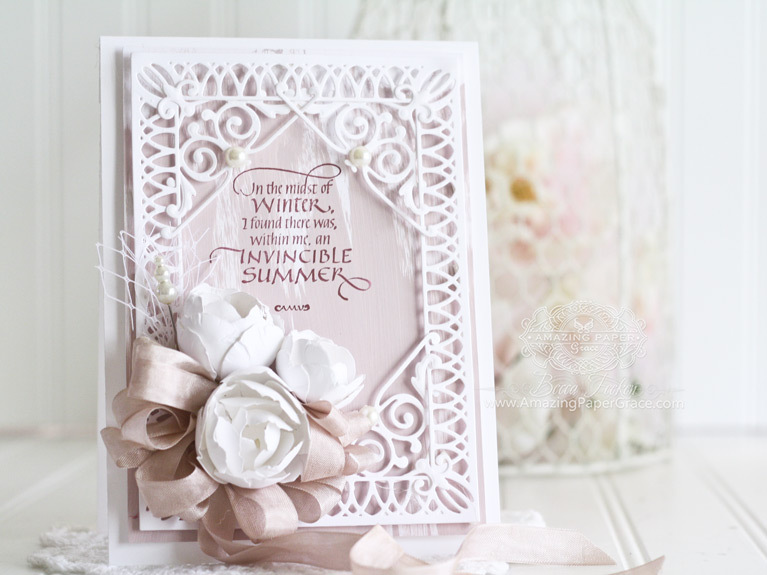 Beautiful creation you have for us today, gorgeous use of dies.